Spa Quality 2 Bd And 2 Bath With A Light Airy Beach Vibe! Beautifully Finished. The BEST location for your Victoria vacation! You are just a few steps from the ocean, parks walking trails and all amenities. Great restaurants and pubs are just minutes away, along with a yoga studio and salon services . Feed the ducks and peacocks in the gorgeously maintained gardens of the world renowned Beacon Hill Park. While you are there pop by the goat barn to watch the daily goat stampede! Cutest thing you have ever seen! All of this and just a very short drive or scenic walk to downtown. The home itself is stunning. 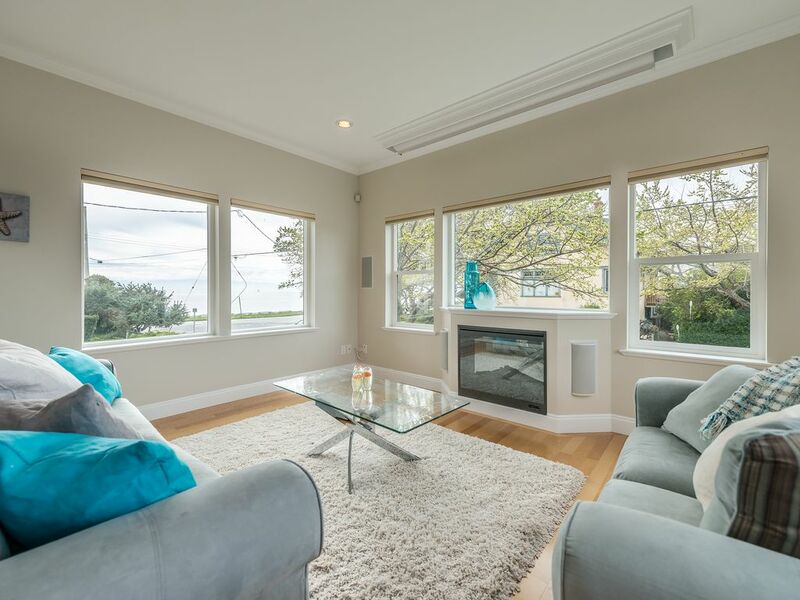 Huge windows in the living room invite you to take in one of the best views in Victoria. That site of the Olympic Mountain range towering over the Pacific Ocean is equally breathtaking to take in from your master bedroom. You can also appreciate that view from the granite counter tops in your gourmet, fully equipped kitchen that is a true dream for those of us that enjoy a beautiful meal. And of course a BBQ is on hand. High end appliances and washer dryer are also included. In the evening you can enjoy movies or the big game on the HD large screen television with built in surround sound. Premium HD cable package is included as well. This is a luxurious 2 bedroom 2 bath and den unit. The main bedroom boasts a king sized bed, walk in closet and spa quality 4 piece bath. You will wake up to the most amazing views! Rain or shin it is stunning. The second bedroom is spacious with a comfortable queen sized bed and just steps away from another beautiful 4 piece bath. It also has a 32' T.V with cable. The sunlight through the authentic antique stained glass windows throughout the space only bolsters the Victorian charm of the neighbourhood. The den has a comfortable day bed for guests or the kiddies. The space opens up with light french doors off the kitchen and provides a wonderful spot to dig deep into that new book or grab a little afternoon nap after the beach! There is a parking spot available on the property and plenty of free street parking for guests. This home is located in one of the finest neighbourhoods in all of Greater Victoria. You will be greeted daily with big smiles from all of the friendly folks in this vibrant community. Enjoy a daily walk along the gorgeous Dallas Road Ocean walkway. The Moss St market is a must visit every weekend during the mild months. The local fresh produce and artisan goods are superb. Many events and festivals are held within the Fairfeild community. We are listing this beautiful property for the first time and we would be pleased to have you as one of our first guests! We do own another unit in the same building so please take a look at our reviews. The VRBO # is 727545. We take great pride in the homes we provide and we believe our ratings are a testament to that. You will not be disappointed! We loved staying in this beautiful, modern apartment. Everything is provided for a comfortable stay. The location is fantastic with views of the sea and great coastal paths nearby for walking. The apartment manager lives in the building and was very helpful during our six week rental. We would definitely like to stay here again. It was a wonderful vacation and apartment. Absolutely the best location of anywhere to stay in Victoria. Beautiful views of the ocean so close and the mountains in Olympic National Park in the distance. It has the nicest decor and a great, functional kitchen that is well supplied. We stayed a month. Unfortunately, it was August, so our view of the mountains was obstructed by smoke from wildfires 20 out of 30 days (no fault of the owners, of course). The fatal flaw (to us) was the lack of noise insulation. It's very bad, the worst of anyplace we've stayed (traveled to 45 countries). You can hear every footstep of the people upstairs, when anyone uses a bathroom, and and who likes to sing along to music. The neighbors next building over like to perform music in the middle of the night, too (really, outside on their steps). We kept the windows closed almost continually, to no avail. We owned an oceanfront condo in Florida for over a dozen years and never heard a neighbor, unless they were using a power drill. This was unexpected. We stayed here for the month of July and thoroughly enjoyed it – in fact we’ve booked again for next year! The ocean view from the living room and master bedroom is unbeatable and the location is fantastic. Had a great stay at this Moss house VRBO. Location is near the water and we enjoyed the views. We were there 4 nights with my sister and her husband. Day 3 and 4 my sister and husband had their window open and the neighbors were still up talking just outside their window not partying or anything but enough to wake them up at 2am. Other than that all was good. Nice kitchen with plenty of amenities. Guys enjoyed the hockey game on the big tv. Easy walk to the ocean. This condo was all around perfect! Clean, quiet neighbourhood, beautiful views of the ocean, all the conveniences of home. Easy drive to the downtown area. We would definitely stay here again.